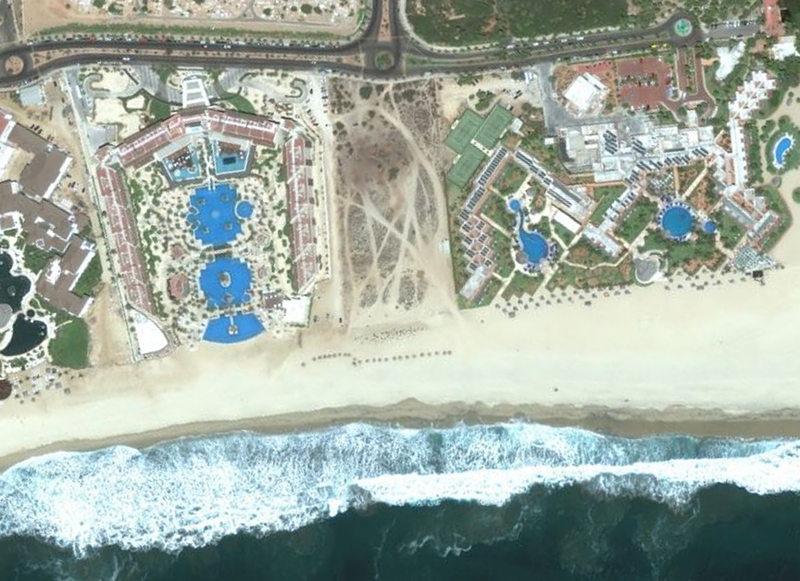 The above image is an aerial of the coastline of San Jose del Cabo in Baja California Sur. Look closely at the parcel of land in the middle of the image. To me, it is one of the most interesting, and emblematic, pieces of land in the whole Los Cabos Corridor. It is a public access point, surrounded by an ever-growing jungle of coastline-blocking tourism resorts. Notice the informal pathways that weave throughout. And the two lines of palapas on the beach. They were created for public use, unlike the large swaths of privatized coastal land, which has been cordoned off to create "exclusive" spaces. And then there's this small bit of land, just sitting there: informal and open. At least, in practice. I don't really know the official histories of this piece of land. What I know of this place comes from experience. You can enter on the south side. The entrance itself is rough--you have to choose just the right path so you don't bounce around too much in your vehicle. Of course, you can always walk in as well. Many people park on the small access road that runs parallel to the adjacent hotel (on the left side). If you look closely you can see vehicles parked near the entrance (at the top) and down by the beach (looks like there are 3-4 cars there). In the central part of this piece of land, someone runs a business renting horses for tourists to ride on the beach. The first time I saw this place, I was fascinated. And it left me wondering: How did this fragment of the past somehow escape the fate of so much of the surrounding coastal land? What's hard to see in the above image is the dramatic contrast between this parcel of land and the surrounding resorts. The hotel on the left (to the south) is a massive u-shaped structure that swallows up the viewshed in its effort to capture the coastline for guests. So many little rooms, all facing the ultimate commodity in this area: an ocean view. This is what has transformed the formerly worthless coastlines of Baja California Sur into prime real estate. Thinking about things this way, it's easy to understand why hotels are built the way they are, like massive amphitheaters that open themselves to the blue sea and white sand. These factories of tourism experience are literally built to squeeze every possible dollar out of each bit of land. Maybe this is why I find that open piece of land so fascinating: it persists. I don't know how or why, but it has survived the geographic, economic, and architectural overlay of large-scale tourism development. Its a remnant, a holdover of the days when the coast of Baja California Sur was part of the "forgotten peninsula" that Joseph Wood Krutch famously wrote about so long ago. Clearly, this place is anything but forgotten these days, as the expanding tourism network attests. The Baja Peninsula is no longer some backwater, some distant place, some geographic unknown. It's on the radar, and year after year more and more people are coming here to live, work, vacation, invest, develop, and shape the landscape. The irony of course is that many travelers found their way to Baja to escape the overdevelopment, crowds, and pollution of places like Las Vegas and Los Angeles. What remains to be seen, however, is whether the forces of development will simply remake the peninsula into another overdeveloped urban blight, or if there's still time--and the political will--to forge another path. This issue of anthropologies explores some of the many facets of the Baja California peninsula--past and present--through our latest selection of essays. This month we have contributions from Don Laylander, Dawn Pier, Pamela Weiant, Shane Macfarlan, Marissa Shaver, and George Bergin (who has contributed a non-fiction essay and a short fiction story). Since my research is in Baja California Sur, I included one of my recent essays as well. Thanks everyone for taking part. Enjoy, and as always please feel free to post any reactions, thoughts, or comments.